To promote its 2009 A4 sedan, automobile maker Audi has released Audi A4 Driving Challenge, a free iPhone game available for download through the App Store. 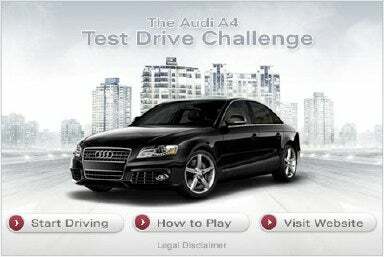 The Audi A4 Driving Challenge lets you drive an Audi A4 sedan through five different courses on your iPhone. The game has you steer the A4 through three laps on five progressively more challenging courses, keep track of your lap time and course time, and displaying your speed. The game, which renders graphics from an overhead perspective, uses the iPhone’s accelerometer for steering, with on-screen buttons to operate the gas and brake pedals. The Audi A4 Driving Challenge is unlikely to give other racing games on the iPhone a big run for their money, outside of the fact that it’s free. But what makes this noteworthy is that Audi is the first vehicle maker to reach out to customers by releasing an iPhone application. What’s more, Audi has set up a “microsite” especially for iPhone users to provide them with more information about the A4, including special videos, wallpaper, a dealer locator and other information. Audi anticipates the A4 sedan to reach dealerships nationwide starting in September, with prices starting around $30,000.